Take a trip to Biltmore to make holiday memories that will last a lifetime! 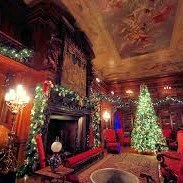 Since Christmas Eve 1895, George Vanderbilt's Biltmore Mansion has been a classic for Christmas cheer and celebration. Explore the Biltmore Mansion during holiday evenings when candles and fireplaces fill the grand home with a warm glow, accenting delicate ornaments and priceless treasures with metallic shine and sparkle, and live music that warms your heart. Take a trip to Biltmore to make holiday memories that will last a lifetime. This morning we depart our hometowns and get acquainted with our new travel friends. We arrive at our hotel in Asheville, NC and freshen up for an included dinner at the Stone Ridge Tavern. Here you will find a family owned and operated establishment which takes immense pride in providing guests a delightful and satisfying dining experience to all who visit. The remainder of the evening is on your own to enjoy as you wish. Breakfast included this morning at the hotel. We will enjoy a guided tour through Asheville, one of the msot welcoming, vibrant cities in America. We will visit the Mast General Store, Grove Arcade, the Basilica of St. Lawrence and much more. Lunch will be on your own along the way. This evening we have reserved seats to the Blue Ridge Mountain Opry for their excellent dinner show which is held at the Asheville Events Centre. This wonderful evening will provide a fun and entertainment time for all - enjoy! This morning is up and at em' for an included breakfast and a day of touring at the lovely Biltmore Estate, known as "America's Home". Christmas at the Biltmore features American's largest home meticulously adorned with dozens of decorated fir trees, thousands of lavish holiday decorations, and endless miles of brightly lit evergreen garlands. To match the massive size of the mansion, a 35-ft. Fraser fir is erected every year by hand. 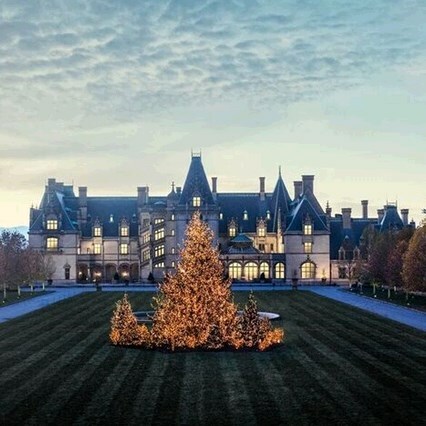 In total, there are approximately 106 Christmas trees scattered around the 8,000-acre estate nestled in the mountains of Asheville and more than half of them are inside the house! Magnificent rooms are lit by candles, and filled with elegant mid-century antiques and tapestries. 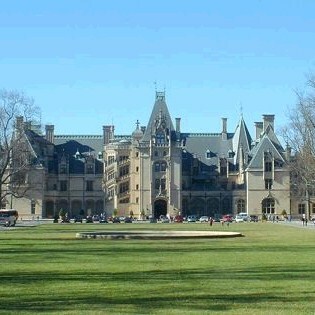 We will start off our day with a self-guided tour through the Biltmore House (audio included). 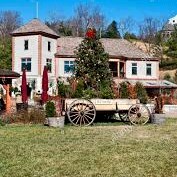 Visit to the Antler Hill Village for shopping and a visit to the Biltmore Winery. Lunch is included at the Deerpark Restaurant. This afternoon we will return to the hotel for time to rest and relax before returning to the Bilmore Estate for an included dinner at the Stable House Cafe. 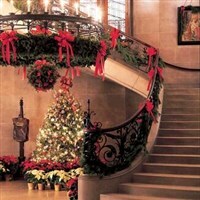 After dinner enjoy a spectacular evening Candlelight Tour thru the Biltmore House with live music, bright twinkling lights, fragrant evergreen wreaths, garland, bows, and myriads of sparkling ornaments. If you've ever thought about seeing this majestic mansion, this time of year is by far the most impressive...and magical! Breakfast included this morning at the hotel. We then depart Asheville for home with many new memories of breathtaking Biltmore Estate at Christmas. Walking Code: 3 This tour includes moderate physical activity. The itinerary blends some longer days with shorter days and more leisure time. Walking tours, as well as walking slightly longer distances, up stairs or on uneven walking surfaces should be expected.